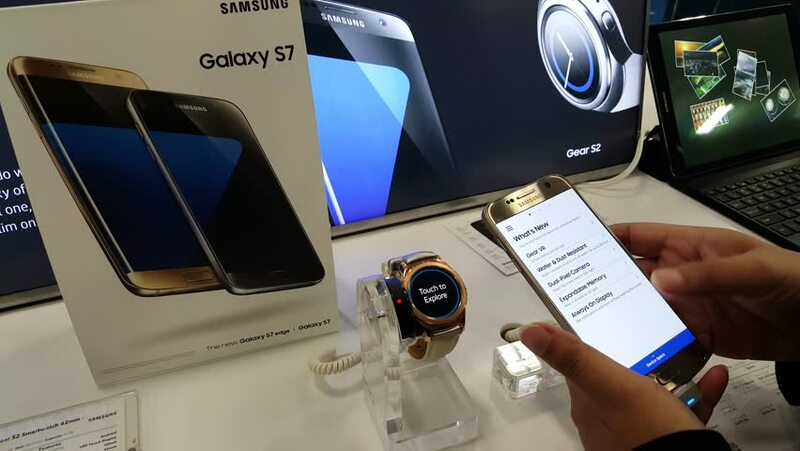 MOUNTAIN VIEW, CA/USA - MARCH 12: Samsung Galaxy S7 edge on display in Best Buy store on Mar 12, 2016 in Mountain View, CA, USA. It is a Android smartphone manufactured by Samsung Electronics. 4k00:11MOUNTAIN VIEW, CA/USA - MARCH 12: Samsung Galaxy S7 edge on display in Best Buy store on Mar 12, 2016 in Mountain View, CA, USA. It is a Android smartphone manufactured by Samsung Electronics. 4k00:06MOSCOW - AUG, 23, 2015: Samsung Galaxy S6 edge on table and hand holding another in GUM, mobile phone video. Samsung Galaxy S6 will compete for sixth IPhone. 4k00:09MALAYSIA, Kuala Lumpur, October 2, 2018: People are relaxing while browsing Youtube app on their mobile phone. 4k00:05Coquitlam, BC, Canada - May 20, 2016 : Man buying JBL bluetooth speaker and taking receipt back inside store with 4k resolution. 4k00:13New York - 12 December, 2018: View over the shoulder on the African american male hands holding white tablet device while he sitting on the sofa and scrolling Facebook app. 4k00:13Man using his smartphone with to scroll a Instagram account feed, scrolling news, tapping on screen. Close-up. 4K UHD. LOS ANGELES - January 2018.